Google and other major search engines continue to redefine their ranking algorithms, making it harder and harder for brands to create high-quality content that receives links and rank organically. Marketers need to continuously find ways to naturally generate authoritative and relevant links for their content and websites. When link building becomes more about link earning, the focus needs to shift to creating exceptional and helpful or entertaining content. Bloggers and website owners rarely want to link to something that’s not valuable to their own business or blog. Nor do they want to link to your products or services, since such content is promotional in nature and in most cases doesn't help their audience. One of the best and most popular ways marketers are creating this standout content is with infographics. An infographic is a visual representation of content and data, presented in an appealing, thought-provoking way. Creating truly helpful and visually appealing content is one of the best ways to increase brand awareness, build your audience, aid in lead generation, and improve conversion rates across the board. You want your brand in front of your target audience, especially those that don't know you exist. What's a good way to do that? Infographics work so well on the web because we live in a world of instant gratification. People are more inclined to share visual pieces of informative content because it's scannable and appealing—giving searchers a solution in the form of a graphic. Searchers want instant answers. They’ve become accustomed to search engines returning the information they want in a matter of seconds. When a brand is new online, or hasn't been using content marketing or SEO, they’re usually not showing up anywhere close to the top of the search results. This means they’re missing the ability to answer the searcher’s problem, and losing the opportunity to turn them into a valuable lead. Instead of only focusing resources on creating long-form content, no matter how valuable it may be, new brands should also focus on creating easily digestible content. Infographics can help your content to stand out from the crowd, especially since there is so much noise out there. Your content, whether it be infographics, videos, blog posts, or anything else, needs to be better than whatever already exists online. 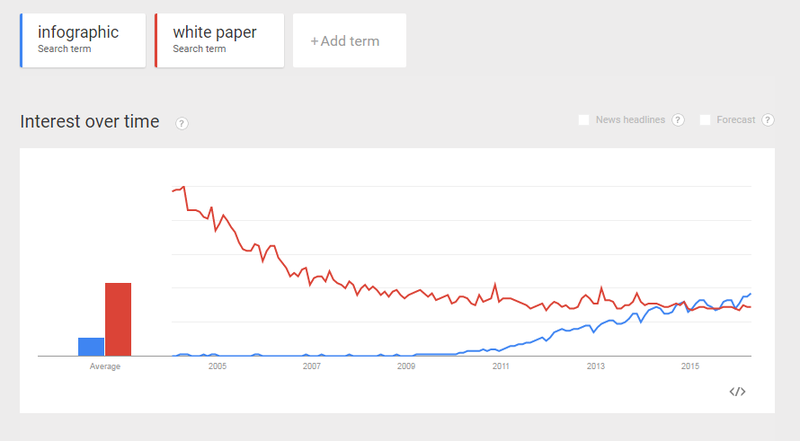 You can see from the Google Trends comparison above that searches for content like “white papers” continue to lose popularity, while searches “infographics” steadily rise in its place. New brands and online businesses can actively benefit from creating and marketing an infographic. Infographics help turn your message into a visual, digital format that’s ideal for sharing. And when people can easily share your content, they help to expose more and more potential customers to your brand. When you create infographics that help or entertain those in your industry, influencers, bloggers, writers, and journalists in the same niche will share it with their audiences. By doing so, they mention and link to your site to credit the source. The more authoritative websites in your industry that link to your site help to increase the overall organic rankings of your website. It shows Google and other search engines that authority sites trust your site by linking and mentioning you, and since Google recognizes those sites as authoritative, it passes along that trust with increased rankings for your site's related keywords. Because, as mentioned before, Google is all about giving the user the most relevant information as quickly as possible when they search it. For example, when our infographic on the evolution of arcade games went on Wired and other websites, a lot of their keywords related to arcade games all saw an increase in rankings. Infographics are easy to post on your website by using an embed code that pastes the image onto you a page and includes a link back to the original source. The best kind of link is a contextual link; that is, one where a writer, blogger, editor, or journalist writes a piece and includes a text link to your source. But the easiest kind of backlink for infographics is the one from the embed code, since all that has to be done is to copy and paste the embed code to the site. Content like this is at the very top of your funnel and avoids diving right into a sales pitch. When you try to sell a potential customer on your product or service too soon, in most cases, they’re no longer a potential customer (as they weren't ready to buy yet). 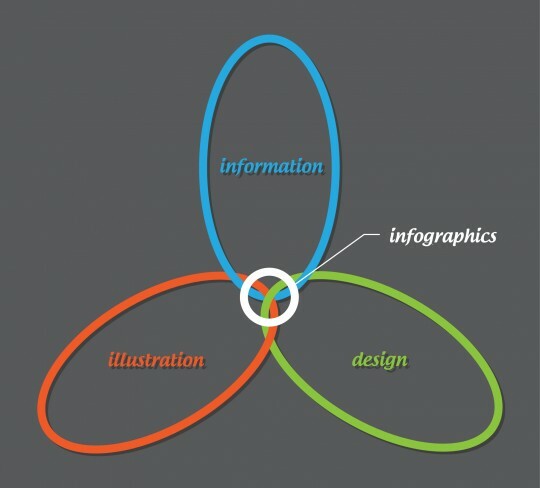 Informative infographics rarely turn potential customers off. They work to give these people entertaining, valuable information while subtly nudging them closer to your brand. While a good infographic helps to move your potential customer through your sales process, it also works to generate leads in other ways. That customer may have found your infographic so useful that they want to share it with their friends on social media, through email, or maybe even post it on their blog. When your infographic is shared, your brand awareness goes up, and so does your ability to attract new leads to your business. If your potential customer is finally ready to buy, they’re more likely to go with a company that has helped them with informative and useful content along their journey. Infographics not only help to present information in an appealing way, they also help increase trust with your potential customers. Customers are more likely to buy from a company they trust over someone they’ve never interacted with before. Now more than ever, gaining the attention of customers online is about earning it. Rather than bombarding potential customers with spam emails, irrelevant offers, and overly “salesy” tactics, you’re allowing them to discover you in their own way. Infographics aid not only in the discovery of your products and services, but also your ability to convert leads into sales. Content should be created to fill a need in your industry and/or to entertain, to answer a common problem or concern your customers have in the best way possible. Using an infographic to communicate content is one of the best ways to naturally draw people into your site or blog. Good content tends to cause a chain reaction: people share your infographic, link to it or embed it on their website, exposing new customers to your brand, gaining links to your site, improving your rankings, leading to more traffic. This chain reaction ultimately leads to increases in traffic to your site from other relevant sites in your industry where your target market is visiting. And, when more people from your target audience are visiting your site, your chances at gaining a conversion are that much better than before. 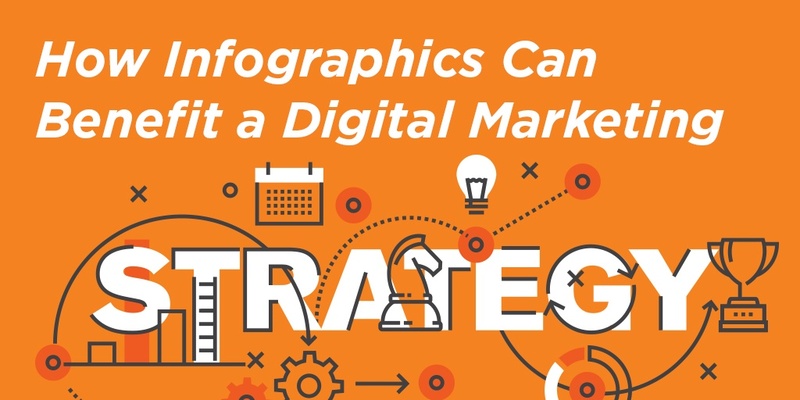 Few long-form pieces of content have the ability to gain customers’ attention, encourage shares, and increase brand trust as much as infographics. When you take the time to build an infographic with valuable information, you’re filling a void and giving customers exactly what they want. There’s no better way to encourage a conversion and build a strong long-term relationship than that. For help with defining and creating your overall digital marketing strategy, contact the marketing professionals at EZMarketing today.